Okay then. All times are cookie times, at least in my mind. It’s never a not good time for a cookie. Or a double negative. What’s your philosophy on the subject of cookies? Maybe you’re a thicker-cookie-with-some-oats kinda gal. 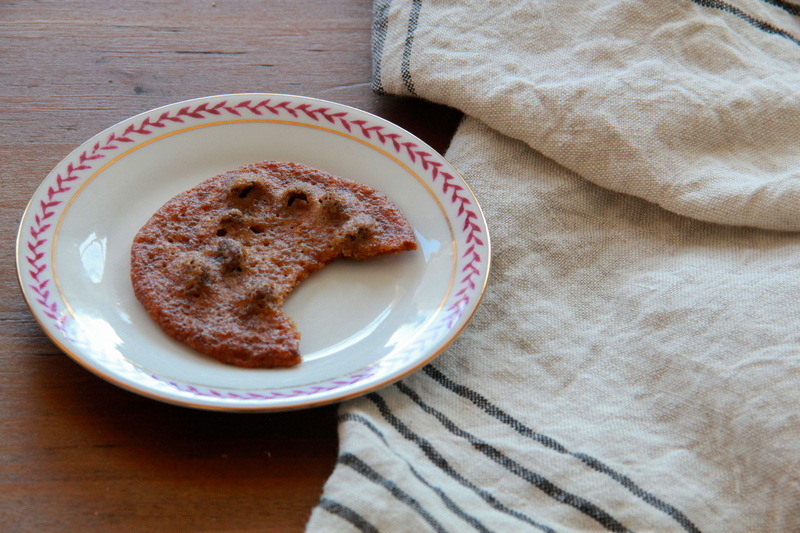 Or maybe you prefer a crispy-edged, sweet-and-spicy molasses and brown sugar kind of cookie? There’s a chance you’re a fan of a smaller cookie (to make your muscles look bigger), like these little cornmeal cookies. Or maybe you’re trying out a gluten-free (but peanut-butter-full) lifestyle? The point is, we’ve made a lot of cookies here, you and me. There were the snappiest of gingersnaps, chewy snickerdoodles that taste like the holidays, fancy chocolate French macarons, shortbread cookies chock full of pistachios, New Yorkish black and white (and pink!) cookies, cookies to bring (deeply chocolate) world peace, and at least four different variations of that classic, the chocolate chip cookie. And that’s not even the half of it. So what’s one more cookie, really? I think it’s only fair that we explore all of our options. 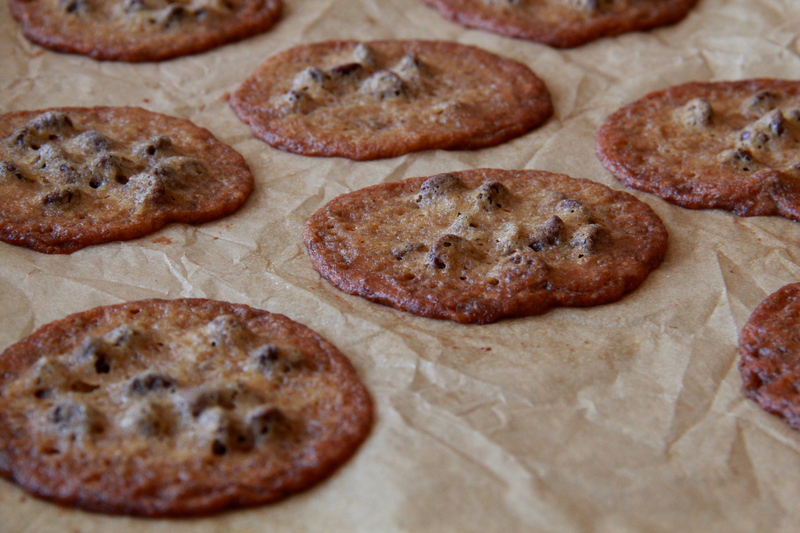 This recipe is for the thinnest, chewiest chocolate chip cookies that you ever did see. They taste deeply of caramel and are almost lacy, their chocolate chips bursting like topographical mountains from the flattest of cookie plains. What do you think? Are you into it, or do you require more body, a little extra umph, in your chocolate chip cookie? I didn’t think I’d love these, since I’m more of a classic, medium-thick cookie gal, but I was wrong. I couldn’t stop reaching for these flatsos — their intense, caramel flavor is addicting, and I like the way you can almost fold them on top of themselves before taking a big, chocolatey bite. 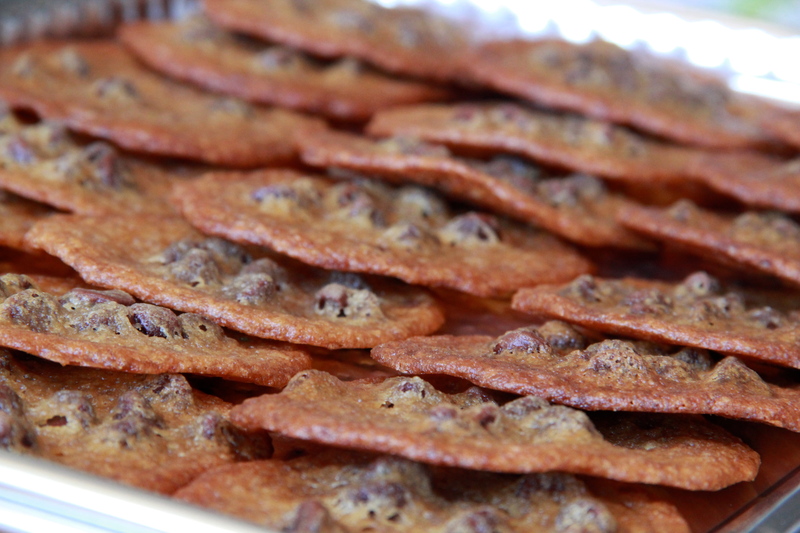 Thin and chewy chocolate chippers – get into it! It’s cookie time. Cream together the butter and sugar until light and fluffy. Add the vanilla and salt and beat well to combine. Add the eggs, one at a time, until fully incorporated. In a small bowl, whisk together the flour and baking soda until combined. Add the flour mixture to the cookie batter and mix gently, until just combined. Fold in the chocolate chips. Cover the dough tightly with plastic wrap and chill the cookie dough for at least an hour (and up to 72 hours — the longer you let it chill, the more developed the flavor will be). Once you’re ready to bake, preheat the oven to 350 degrees F and line a baking sheet (or two) with parchment paper. Drop the cookie dough by the rounded tablespoon onto the prepared sheet(s), spacing them about 3-4 inches apart (they spread a lot). 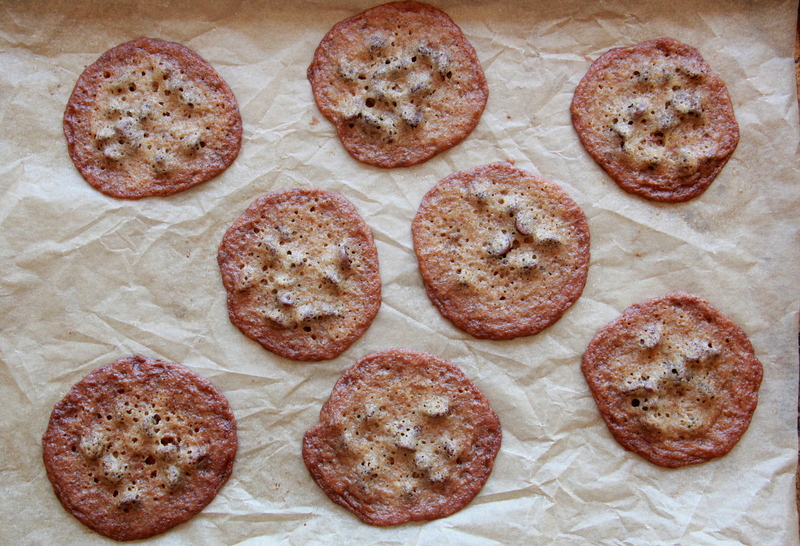 Bake the cookies for about 10 minutes, until golden brown throughout. Allow cookies to cool on the sheet for at least 5 minutes before carefully transferring them to a wire rack to cool completely. Makes a lot — about 60 cookies. it really frosts my cookies that we have come so far and we have worked so hard and now we have to STOP. I ate these. They were good. Love the layered cookie photo. Will definitely have to try these crispier versions. I’m usually the thicker chewy gal, but these look amazing. I wonder how much of the butter could be replaced with mashed banana with delicious, non-chewiness-threatening results? Although those 2 1/2 sticks of butter are pretty spread out over 60 cookies. But I have a feeling that would just make me feel entitled to eat twice as many. It’s definitely a bracing amount of butter — I haven’t tried it with mashed banana or anything, but I imagine substituting will definitely kill the thinness (though not necessarily the chewiness) of these cookies. Try it (I’d maybe swap 1/2 cup of butter with banana, to start), and let me know how they turn out! I made them with the 1/2 cup mashed banana like you suggested, but I wasn’t thinking and only reduced the butter by 1/4 instead of a half cup–so they had two sticks of butter plus a 1/2 cup mashed banana. I reduced the sugar by 1/4 cup for the bananas. They still turned out amazingly delicious, but with a totally different texture, which makes sense. Really tender and moist, almost falling apart when you pick them up, and still thin but fluffy. Wonderful to know! Thanks, Kara! Chocolate chip cookie-off next weekend? I’m in! My dough is chilling in the fridge right now. Can’t wait to bake them however, I’m a little concerned about the amount of salt that the recipe calls for. I was hesitant but I went with anyway, I just hope it wasn’t a typo. I have been looking forever for this type of cookie.. My mom used to make cookies and once in a while they’d “fail” like this and they were the best. I followed the recipe exactly but they didnt turn out flat.. They turned out like a normal cookie. Wondering if i add even more butter or less egg if theyll go flat crispy..